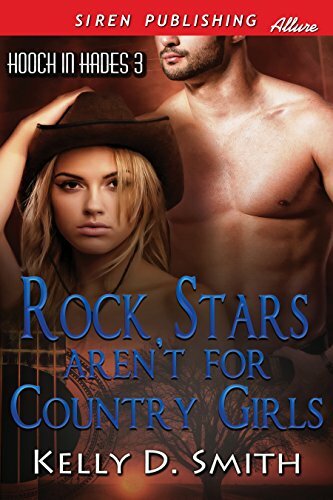 Anna Helbern, a country girl through and through, never expects to find anything in common with a rock star—boy is she wrong. Adam Cooper doesn’t get what it is about this girl, maybe it’s her passion for music, or maybe it’s that damn tattoo she has. Whatever it is, when he asks her to do a country album with him (something no one would expect from the world’s most popular rock band) she agrees, and they head to LA—together. Anna won’t give up her dream, and if a rock star is what’s going to make it happen, she’ll take the chance. But when she gets to LA, she can’t believe the ride she’s on, and soon it becomes clear that she doesn’t want to get off any time soon. What happens rock’n’roll and country crash? A country girl and a rock’n’roll boy with a country soul. She had just bet a celebrity—and she snapped at him. Anna stepped out of the car and grabbed her cowboy hat. She placed it over her head and padded to the back door for the band to enter. “Anna!” James exclaimed. He padded to the bar, already getting her a drink. Anna grinned as she followed him, her heels clinking softly against the wood floor. His voice sounded like silk, but it made her heart skip a beat. She spun to face him, her mouth hanging open. She raised an eyebrow, trying to keep cool. Her eyes widened. Of course flyers were all over the place promoting their show tonight, but she hadn’t expected him to actually notice that. She took a deep breath and smirked. They shook hands as his eyes roamed over her body. “Nope. I had no clue what your name was.” And she hadn’t. She wasn’t a fan of the kind of music he played, at least she was guessing she wasn’t considering she’d never heard one of his songs before. As far as you know, she thought. He let out a soft laugh. “Well, I’ll be damned.” His smile widened as James brought Anna’s drink over. “Thanks.” She gave him a quick smile. Anna groaned. What were they going to do? “Great,” she muttered. They’d have to cancel it. There was no other option for them. Anna ran her fingers through her hair. I’ve got to find someone who can replace him. Maybe someone I know…. No, she’d know if there was someone. Anyways, they’d have to learn all the songs for the set list. Anna blew out a deep breath. She could feel the stress inching to every part of her body, her muscles tensing. “Nine,” Jesse answered before Anna could. Adam bit his lip, a movement that sent a shiver down Anna’s spine.